Kyoto is one of my favourite places in the world to visit. I’m a bit of a romanticist, so when I think about my time spent there my heart skips a little bit. There’s something just about this city that makes me feel good. I love that no matter how busy and bustling with tourists it gets, there’s always a quite respite from the crowds in (one of the 1600) moss covered temples. 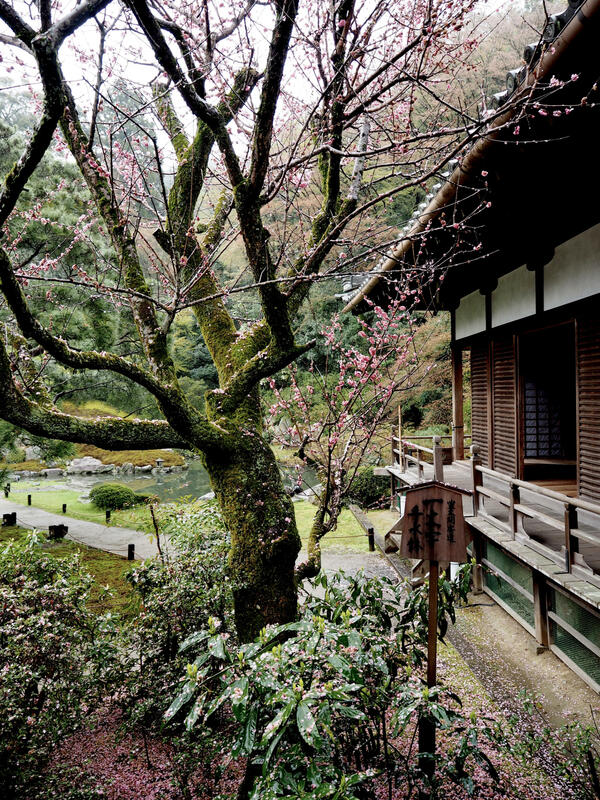 I love the colours; dark moss green, wood, delicate pinks during sakura season. I love the food, I love the weather (especially in the rain – it’s so moody and beautiful). There’s something about sitting under the wooden eves of Shōren-in, watching the rain run over the cobbled courtyard, knowing just outside the gates there are hoards of visitors just like you who haven’t quite made it there. 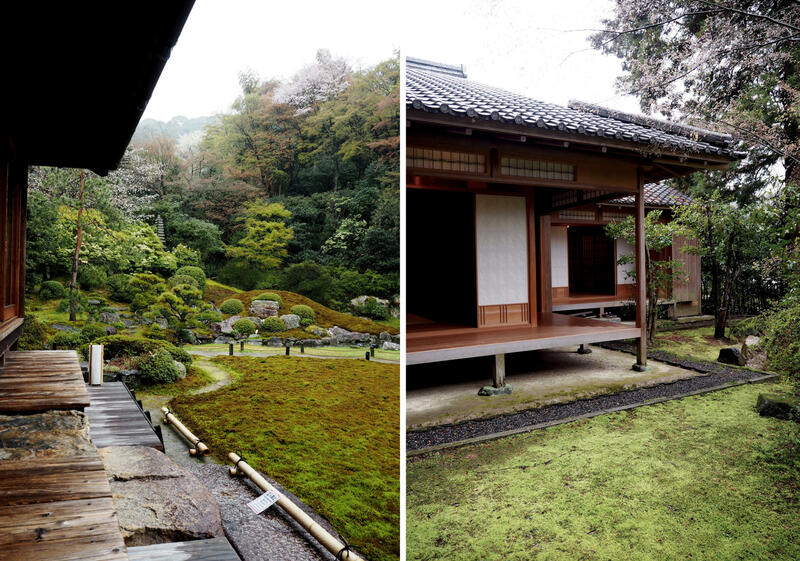 Shōren-in and Hōnen-In are two of my favourite (and I’d say underrated) temples in Kyoto. As much as I do and always will love some of the busier more instagram recognisable sights such as Fushimi Inari -Taisha and Ryoan-ji (two must visits if you’re ever in the city by the way), it’s the more overlooked temples I’m really drawn to. 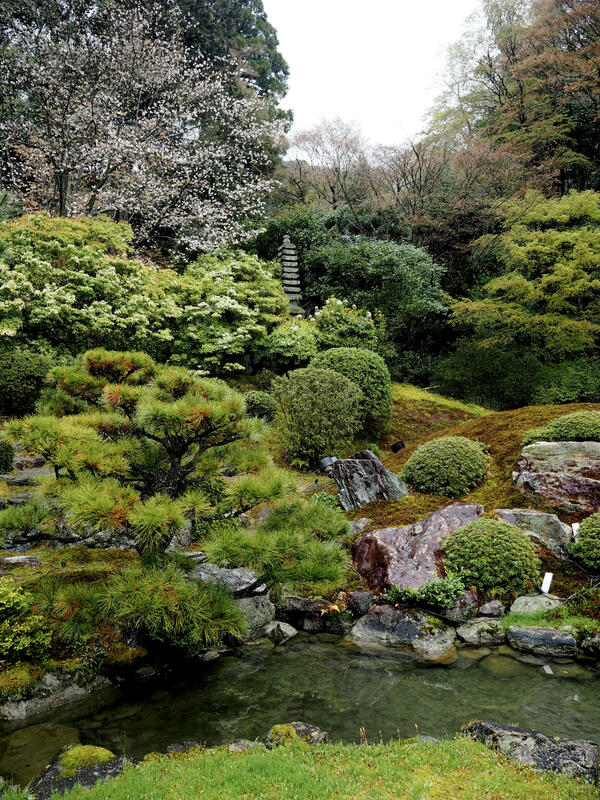 A Japanese garden is something you have to admire for hours, and I just don’t feel as though you really feel how beautiful it is if you can’t sit and enjoy it with a cup of green tea and complete silence. 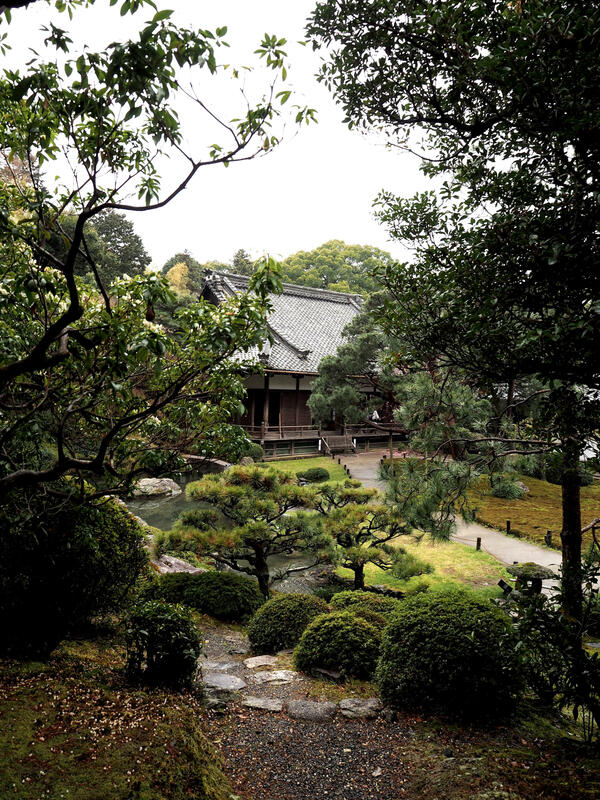 A short walk away from the incredibly crowded Ginkakuji lies Hōnen-In. 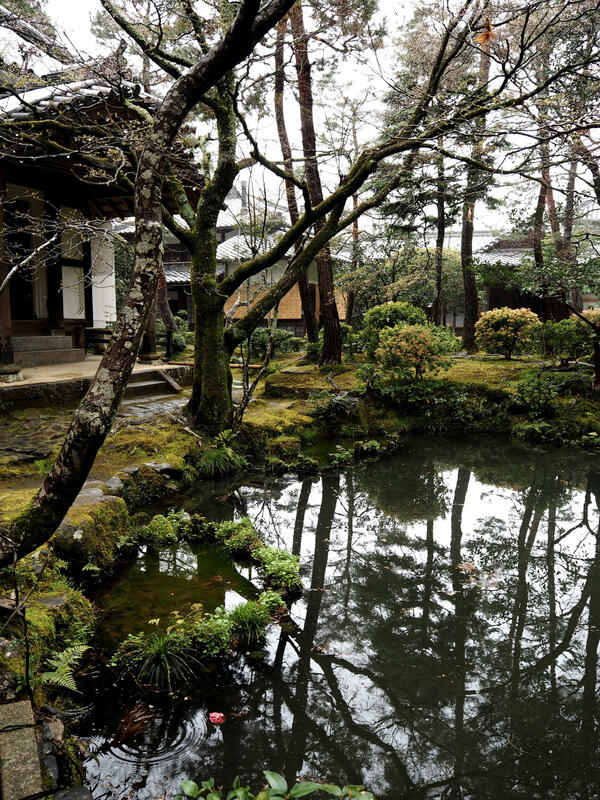 A moss garden, a pond, carefully raked white sand (Byakusadan) make up this beautiful, tranquil space. Despite visiting during cherry blossom season (the busiest time of year in Kyoto), we were two of only five people here and managed to enjoy the the garden in peace. Sadly for us Hojo Hall itself was closed for prayer when we were visiting, but the little art exhibition next door was open. 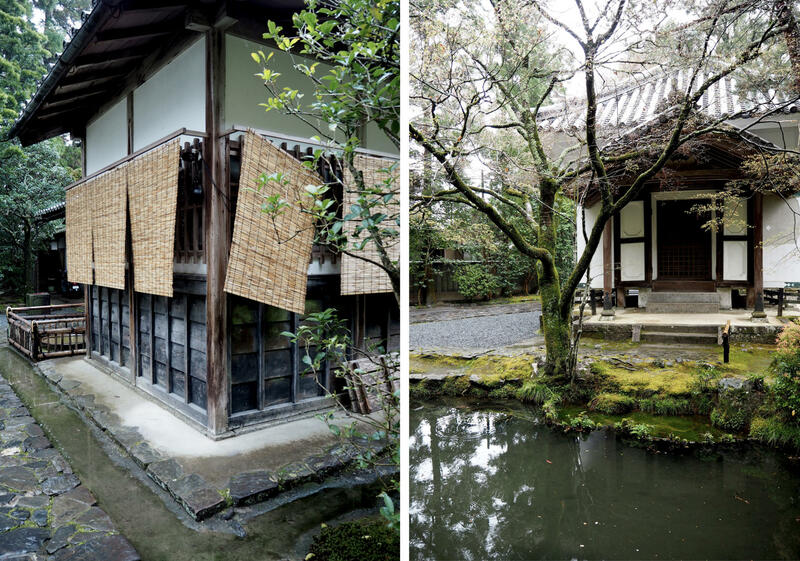 A perfect place to visit if you’re a fan of moss gardens and quiet shadowed spaces. Shōren-in is one of the five Monzeki temples of the Tendai sect in Kyoto and is nestled up a side street in the Southern Higashiyama area. It’s peaceful, sheltered and – for want of a better word – solemn. I visited on a rainy day in April this year, and as I sat looked out of the open sliding doors onto the garden I felt (for once) at complete peace. It’s a perfect little sanctuary, and I would have stayed here the whole day had I had more time in Kyoto. We also attended a small private tea ceremony here in a tiny palace in a secluded area of the gardens, which was magical. Like many things, pictures just don’t do this place justice.